URBANA, Ill. – Plants convert sunlight into energy through photosynthesis; however, most crops on the planet are plagued by a photosynthetic glitch, and to deal with it, evolved an energy-expensive process called photorespiration that drastically suppresses their yield potential. 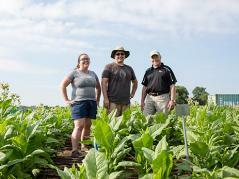 Today, researchers from the University of Illinois and U.S. Department of Agriculture Agricultural Research Service report in the journal Science that crops engineered with a photorespiratory shortcut are 40 percent more productive in real-world agronomic conditions. The team engineered three alternate routes to replace the circuitous native pathway. To optimize the new routes, they designed genetic constructs using different sets of promoters and genes, essentially creating a suite of unique roadmaps. They stress-tested these roadmaps in 1,700 plants to winnow down the top performers.